ISTANBUL, TURKEY. 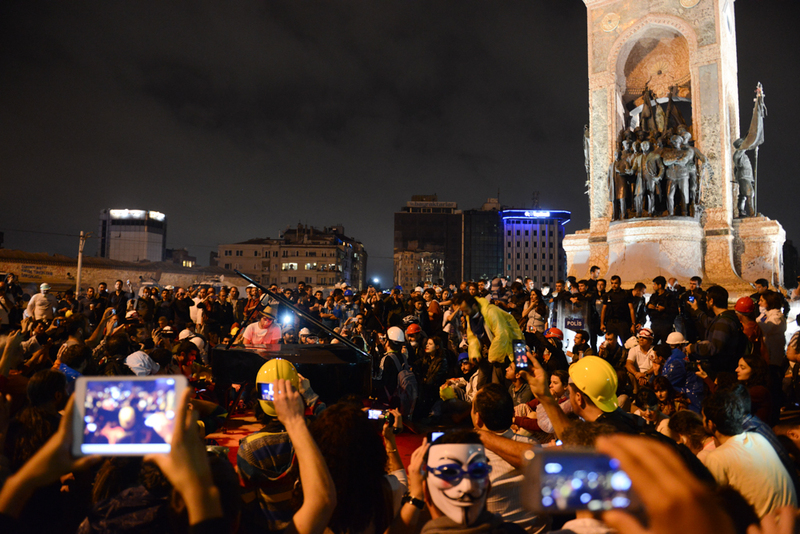 Davide Martello, an Italian pianist and peace activist, plays The Beatles' "Let It Be" and the Italian partisan song "Ciao Bella" on the piano to a crowd that includes riot police in Taksim Square the evening after riot police moved to retake the square the night before on June 12, 2013. After 11 days of protest and occupying Gezi Park adjacent to Taksim Square, riot police firmly took control of Taksim Square with street battles on back streets occurring until the early hours of the morning and a few hundred demonstrators continuing to camp out in the adjacent Gezi Park.